Hey everyone! Thanks for joining me today, for the August Papertrey Ink Senior DT challenge. This time around we are bringing back Happy Trails! It's been fun pulling out this set. Happy Trails has always been a favorite of mine ever since it was released. Working with this set once again was like rekindling a friendship with an old friend. Definitely an oldie but goodie! I've whipped up a couple one-layer cards using one color combo and two different images. First up the butterfly, which I've stamped into a repeating row using a happy color combo. 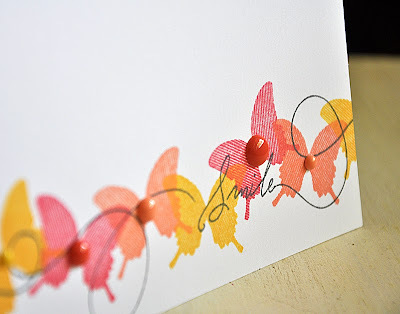 Over the butterfly row I stamped the twirly trails and a sentiment in grey ink. Then finished the card off with a few enamel dots. Up next, one of the two bird image included in this set. I stamped it in a trio, using the same cheery colors as above, to enhance the sentiment. Such fitting images for such a heartfelt sentiment. 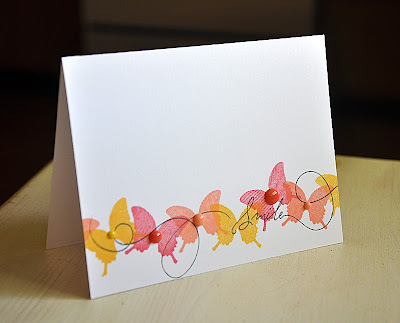 Maile, your cards are simply gorgeous! Love the color combo and the simple but elegant design. GORGEOUS love the color combo! Beautiful cards!! Love the simplicity! Your "clean" style is right up my alley. Love the cards and the beautiful color combo. 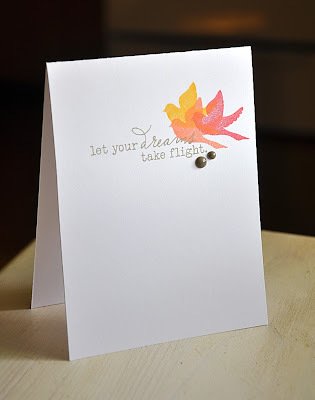 These cards are so simple and delicate. I love them! The butterflys look like thet are dancincing. Love the effect. The bird s loot like they are taking flight. you always are my favorite designs and stamp collections. what ink colors did you use on these? Maile, both of those cards are just beautiful. Thank you so much for sharing your talent and I've decided to go buy the set. Beautiful Cards! Looks Intricate without too much fuss!